When I was a little girl, I hated mung bean sprouts, which we call “tauge” in Indonesian or “dou ya” (literally “bean sprout”) in Mandarin. 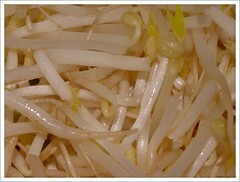 At the market, they’re often labeled simply bean sprouts. It had nothing to do with their bland flavor or the weird crunchy yet porous texture of their skinny white bodies (mung bean sprouts have a high water content), but everything to do with the fact that I was always roped in to snap the tails off these little buggers. Yes, with their tails off, mung bean sprouts look neat and tidy and taste a whole lot better (if you’ve ever had any straggly, stringy and musky-tasting bits in your mouth, you’ll know what I mean) but it was a childhood chore that I didn’t quite enjoy when I could’ve been outside riding my bike or catching spiders in the drain. Now that I’m an adult, I do appreciate the aesthetics and the texture of a tail-less sprout, especially since I can buy them already washed and tail-free. In fact, I am offended every time a restaurant serves me sprouts with their tails still intact (which happens quite often at the Vietnamese hole-in-the-walls I tend to frequent). Just as the name implies, mung bean sprouts come from–wait for it–mung beans, also known as mung, moong, mash bean, green gram, etc. Remember those science experiments in elementary school? Boy, do I remember them! I remember cushioning a handful of green mung beans on a bed of cotton wool soaked with water and sticking them on a warm window sill to germinate. Within days, the beans’ hard shells would split and tiny sprouts would start poking out. What a thrill! I never tried eating them though (I learned earlier on in life that science experiments are not meant to be eaten). 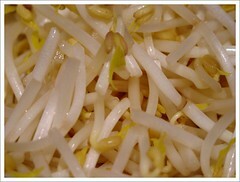 There are no lack of culinary uses for mung bean sprouts. They’re often stir fried with garlic and ginger, or the way I like it, with pieces of salted dried fish. Fresh bean sprouts are rolled into Vietnamese spring rolls and are used as a garnish for phở and numerous soup or dry noodle dishes in many Asian cultures. They’re tossed into fried noodles (think Singapore char kway teow and Hokkien mee) and in Korean cuisine, they’re blanched and seasoned with sesame oil, garlic and salt and served as banchan. Don’t confuse mung beans sprouts with soybean sprouts—they have bigger, droopier heads–which are popular in Korea. 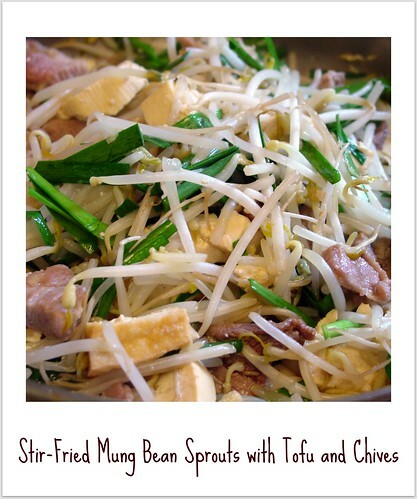 Because of their high water content, mung bean sprouts get slimy, and inedible, quickly. Store them in the crisper for no more than 2 days after purchasing. This is another dish that Pranee kindly showed me how to make. Together with pork and chives, the combination of soft and fried tofu plays a fun game of textures in the mouth. Don’t worry about cutting the tofu to the exact measurements, they are only a guide. Just as long as the pieces are bite-sized and manageable in the wok, you’re good to go! Vegetarians can omit the pork for a tasty and nutritious protein-rich dish. Handle the pork partially frozen so that it is easier to cut (if it’s fresh, place in the freezer for about 30 minutes). Cut the pork along the grain into 1 1/2-inch-thick strips. Then, with your knife at an angle almost parallel to the cutting surface, slice the meat diagonally across the grain into 1/4-inch thick slices. Preheat a large wok or skillet over medium heat for about 1 minute. Swirl in the oil and heat until it becomes runny and starts to shimmer. Add the garlic and cook until golden and fragrant, 15 to 30 seconds. Throw in the pork and stir and cook until the meat just loses its blush, about 2 minutes. Add both types of tofu, followed by the bean sprouts. Sprinkle with the soy sauce and sugar and toss gently for 1 minute, being careful not to break up the soft tofu. 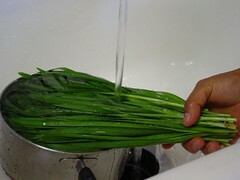 Add the chives and white pepper and stir everything swiftly, but gently, around the wok. Once the ingredients are heated through, about 1 minute, remove from the heat. Serve with freshly steamed rice. We call mung sprouts TAUGE in Filipino, too. And I too hate hate hate the tedious tail preparation. And we also have the exact same dish! We call it “Tauge Guisado” or “Ginisang Tauge”, both of which mean stir-fried mung sprouts. If you’re not vegetarian, adding dried shrimps or ground pork to the recipe heightens the flavours. 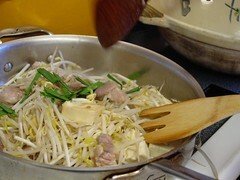 Left-overs of this dish are used as fried spring roll filling in the Philippines. I’ve discovered there are so many similar dishes across all the Asian cuisines. It’s pretty cool! Thanks for the tauge tips especially the spsring roll filling 🙂 That’s a great way to use up leftovers besides fried rice. Tuty, I’m sure I have. It’s with noodles and tahu right? Anything the abang sells is tasty! Must be the sweat and the dust :). Have you had tauge goreng?Oh I miss that dish from the “abang”. Homegrown bean sprouts aren’t as big as those sold in the market. I wonder what their secret is. I love the baby sprouts in my rawon soup. As a kid I HATED pinching tails off of beansprouts! But now I make my own kids do it. heh heh heh!!! the perfect solution to household chores–kids! i hear ya, jaden!